蛍 The kanji image shows a "lantern insect" . Their appearance along rivers of Japan brings a romantic, poetic feeling to all who watch them. And it did not cost the farmers a penny to go out and enjoy them. The "fire" these animals emit is cold, though. There are more than 40 different types of fireflies known in Japan. 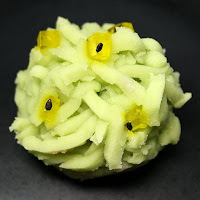 (another name for Minamoto no Yorimasa), . He was a warrior, leading the Minamoto armies at the beginning of the Genpei War. Suffering defeat, he committed suicide in the Byodo-in temple in Uji. Some fireflies are named after the region where they were most beautiful and romantic to watch, in a historical setting. 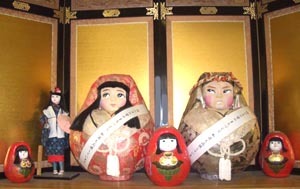 the Heike-botaru and the Genji-botaru 源氏蛍, are special kigo in Japan. To understand the deep appreciation of the Japanese for fireflies, you need to know a bit about Japanese history and the conflict between the clans of the Heike and the Genji around 1180, which ended in the fall of the Heike clan.
. . . CLICK here for Photos of Heikebotaru!
. . . CLICK here for Photos of Genjibotaru !
. . . CLICK here for Photos of the Tale of the Heike! From the example of the firefly you see how a small animal like a firefly can be a guide to the rich history and art of Japan. Mostly in the mountainous regions. The ones along the River Uji are most famous. They are out a bit earlier than the smaller Heike fireflies. a common pastime in olden times, along the famous rivers and rivulets. A free passtime that even the poor farmers could enjoy. often made from bamboo in the old days. 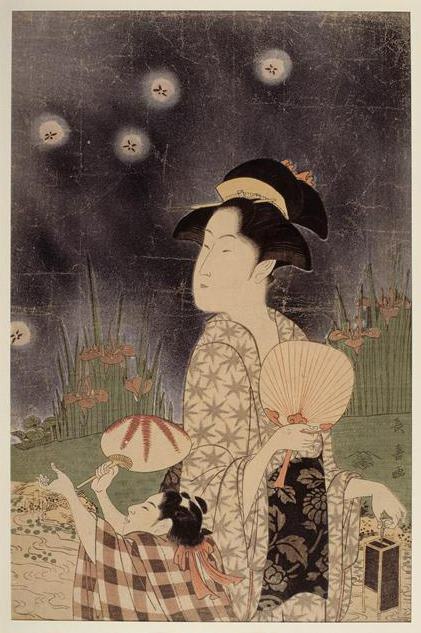 To look at and catch fireflies was one of the common pleasures of the farmers since ancient times. Since the widespread use of farm chemicals, their number has greatly declined and nowadays many villages in Japan make special efforts to multiply these wonderful animals as an attraction for tourists and playground for the local children. The water over there is bitter. so come here, please, fireflies. ....The trembling girl crouched upon the balcony. Affrighted by the clash of arms, a swarm of fireflies rose from the river bank, soaring upon the night like sparks from a mighty conflagration. It is quite a long story within a LONG story! Click on the picture to see them down by the river. Remembering a story of the Genji Monogatari 蛍兵部卿宮. Ah, the cunning fireflies ! 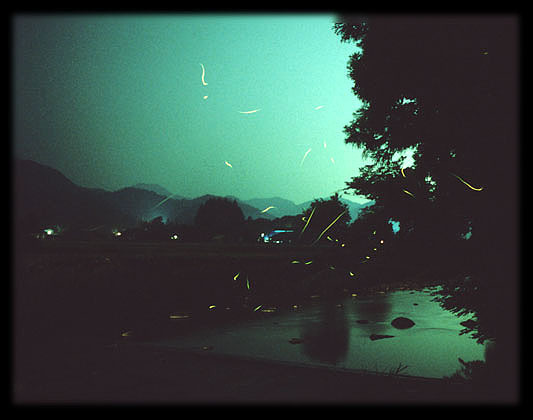 From the Uji river-bank dart myriads of these flashing insects, and in a moment they form a great silver-shining cloud. The cloud breaks and the flowing river, once dark as black, becomes a winding stretch of gleaming jewels. Do I see only fireflies drifting with the current? Or is the Night itself drifting, with its swarming of stars? 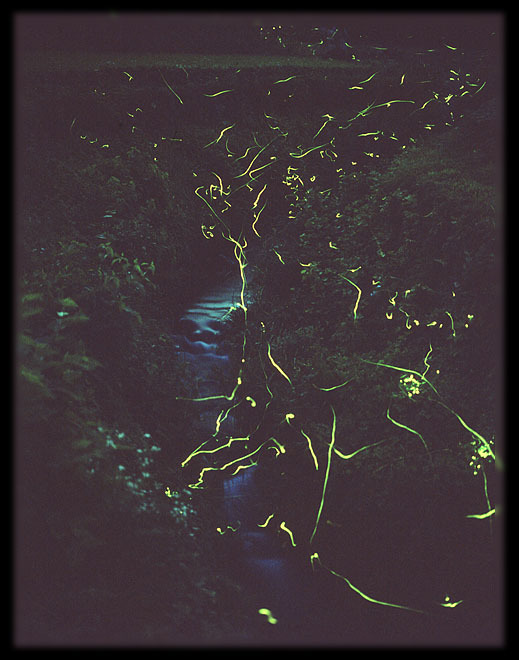 Fireflies are fond of swarming around willow-trees, which are the most eerie trees in Japan, and this is part of their "ghostly" role as Minamoto Firefly and the Taira Firefly. In ancient days, the fireflies were said to possess medicinal properties. Firefly ointment was said to render all poisons harmless, and, moreover, it had the power to drive away evil spirits and to preserve a house from the attacks of robbers. Story called the Vengeance of Kanshiro. A very old man named Kanshiro wants to make one last pilgrimage before he dies. His neighbors and friends all lend him some money to help him. Along the way he is robbed by an inn keeper named Jimpachi. Kanshiro dies, but comes back from the tomb transformed into thousands of fireflies and the fireflies rush into Jimpachi's eyes, ears, mouth, and nose. Jimpachi lives for 20 days, screaming for mercy. But no mercy comes, and finally the fireflies kill the wicked Jimpachi. Immediately thereafter, the fireflies disappear completely. 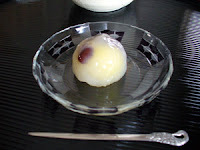 hotarumeshi, hotaru meshi ホタル飯 "firefly rice"
Check out the translations of David Lanoue. Literally, the firefly (or fireflies) are flitting with "bone-breaking" effort ... to reward the people who are calling. in bumpy circles . . . Reflected in every paddy field"
In 1688 (Genroku 1), Basho looked flying around fireflies on the surface of Seta River in Ohmi (The present Shiga Prefecture) on the way home. At that time, he remembered viewing the moon in Sarashina of Nagano, that was noted for "moonlight reflected in every paddy field" and composed this Haiku. The whole district was called "The mount of Hime (princess)". 河野通有　Michiari Koono's uncle, Michitoki went to the war of Mongolian Invasions (of 1274 and 1281), leaving his only daughter "Hime" and he was killed in the Bay of Hakata. Michiari carried his remains back to Hime waiting up her father. Hime had been staying at Gianji Temple 義安寺 and kept the grave of her late father throughout her life. Gian-Ji temple in Matsuyama is a zen temple, so it had been said that the origin of "Hime Daruma doll" is a tumbler of Bodhidharma on that Hime's face was drawn, to hold a memorial service for Hime. Michiari was a samurai of Iyo (ow Ehime) and died in 1311. The temple Gina-Ji had been build by the child of Kono Kagemichi 河野景通, Kono Shiroo Gian 河野彦四郎義安 in 1539. Mitarai River flows under Gianji Temple from the front of Ishiteji Temple and it is famous for its Genji fireflies. There would be some fireflies that were pressed by catchers and went out in the hill at the back of the temple, that of the main gate had been already closed.
. Daruma and Fireflies . When one grows out thousands of seedlings, something special always pops up. ‘Pantaloons’ is such a special plant; the flowers are a light purple and shaped in a double ‘hose-in-hose’ like we’ve never seen before. A rose-purple-dipped drink for the eyes! This is a tasty combination of red winter leaves (& wine-darkened summer leaves) topped with huge, rose-purple blooms. Easy to grow with a spreading habit. A sun lover of Japanese origin.
. Firefly squid (hotaruika, hotaru ika 蛍烏賊 ) .
. hotarusoo 蛍草 (ほたるそう) "firefly plant" . hotarukazura 蛍蔓 (ほたるかずら) "firefly vine"
Under "things found on the way", it would be lovely to include a link to "Grave of the Fireflies", which I watched last night -- beautiful film. Thanks for the page -- no fireflies here, and this brings them very close!
. Happy Haiku Gallery, Gabi Greve. June 2006 . Arachnocampa is a genus of four fungus gnat species which are, in their larval stage, glowworms. They are found in New Zealand and Australia in caves and grottos, or sheltered places in forests. thanks a lot for your fireflies, Tom san! Read the comment by Chris Drake. This hokku was written on 4/20 (June 6) in 1806, while Issa was staying for a few days with a student in Tagawa, a town on the Tone River just northeast of Edo. In this area the mating season for fireflies, that is, the two weeks when each variety flies around flashing its lights, is usually from the middle of May to the middle of June, depending on the variety. Issa seems to have come to town at a time when most people have been watching fireflies for two or three weeks already and the fireflies are beginning to thin out, yet in the garden of the place where Issa is now staying (or perhaps in a thicket outside Issa's window in a room in the house) the fireflies seem to have only just arrived. The fireflies could be of a different variety of firefly from those that have appeared already, or breeding conditions and weather along the large Tone River might be variable, or perhaps the oddball fireflies are just as eccentric as Issa is. 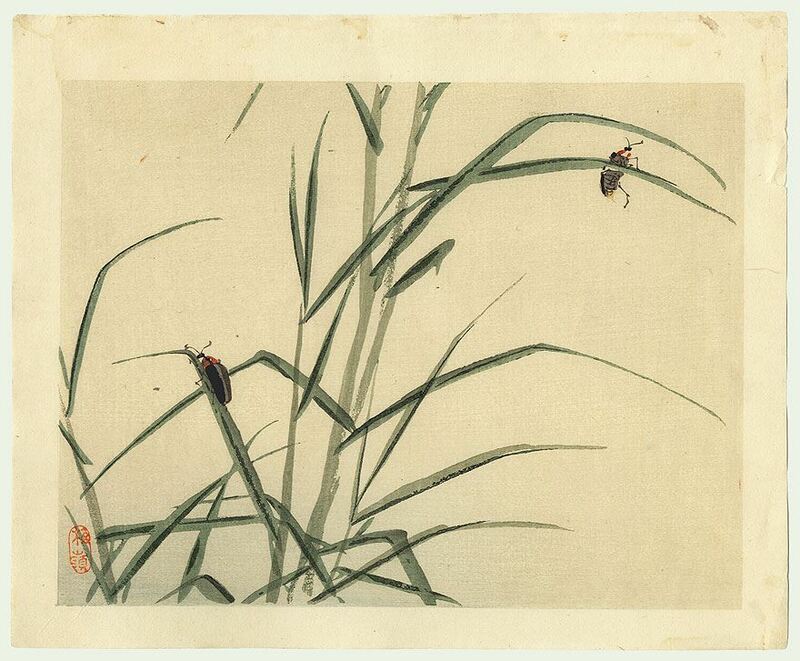 Above is the version of the hokku in the copy of Issa's Eighth Diary made by his follower Yamagishi Baijin (梅塵), found in Issa's collected works at 4.240.
about fireflies . . .
One of the Rokkasen 六歌仙 Six Immortal Waka Poets. kitsunebi 狐火と伝説 Legends about the "fox fire"